John Falter was born in Plattsmouth, Nebraska, in 1910. His family moved to Falls City in 1916, where his father established a clothing store. As a high school student, Falter created a comic strip, Down Thru the Ages, which was published in the Falls City Journal. J. M. “Ding” Darling, Pulitzer Prize winning cartoonist of The Des Moines Register, saw some of Falter’s cartoons and said he should become an illustrator. In 1943, he enlisted in the Navy and his talents were applied to the American war effort to spur the recruiting drives. Falter designed over 300 recruiting posters. One popular Falter poster dealt with the loose-lips-sink-ships theme. It showed a broad-shouldered Navy man with the caption, “If you tell where he’s going, he may never get there.” During this period, he also completed a series depicting twelve famous war heroes for Esquire magazine. Falter’s first The Saturday Evening Post cover, a portrait of the magazine’s founder, Benjamin Franklin, is dated September 1, 1943. That cover began a 25-year relationship with The Saturday Evening Post, during which Falter produced 129 covers for the magazine until The Post ceased publication in 1969. Falter commented, “There were plenty of Rockwell imitators and J. C. Leindecker imitators. My main concern in doing Post covers was trying to do something based on my own experiences. I found my niche as a painter of Americana with an accent of the Middle West. I brought out some of the homeliness and humor of Middle Western town life and home life. I used humor whenever possible.” Of Falter’s 128 covers, nearly all were his own ideas. “Four didn’t make it,” he said, “probably 12 ideas were supplied by The Post.” Falter also did illustrations for Good Housekeeping, Ladies Home Journal, Cosmopolitan, McCall’s, Life, and Look. Falter stated he thought The Saturday Evening Post would provide him with lifetime employment. “I was sort of going along on a ship that would never sink,” he said. “It seemed that nothing could possibly happen to The Post. Then suddenly, in my middle life, I had to retool and give up my horse for a car.” Falter was forced to spend much of his savings in the months that followed. John Falter was a creative man who understood the value of discipline and knew that, without it, inspiration perished. Although best known for his The Saturday Evening Post covers, Falter was a prolific artist who depicted a wide range of subject matter in a variety of media. As television eliminated many national magazines in the 1950s and 1960s, Falter turned to portrait painting and book illustration. He illustrated over forty books, and one of his favorite projects was illustrating a special edition of Carl Sandburg’s Abraham Lincoln – The Prairie Years. Falter produced a body of work impressive in volume and variety of subject. Reflecting a lifelong interest in jazz, he did scenes of Harlem nightclub life in the 1930s, and later on, portraits of famous jazz musicians. An excellent portrait painter, Falter had Clark Gable, James Cagney, Olivia de Haviland, and Admiral Halsey among his sitters. During the 1970s and 1980s, Falter turned to historical and western themes. The 3M Company commissioned him to do a series of six paintings in celebration of the American Bicentennial, titled From Sea to Shining Sea. 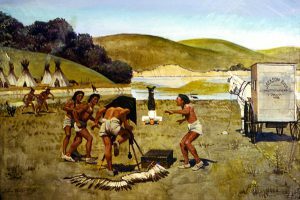 Falter completed over 200 paintings in the field of western art, with emphasis on the westward migration of 1843 to 1880 from the Missouri River to the Rocky Mountains. He was honored by his peers with election to the Illustrators Hall of Fame in 1976, and membership in the National Academy of Western Art in June of 1978. When Falter was asked to look back over his career, he commented that he had never painted a painting that he wouldn’t like to paint over again; he always saw something he thought he could improve on. John Falter died in Philadelphia in May, 1982. The Museum of Nebraska Art holds 79 works by John Falter.